CAPE MENDOCINO the South Promontory in Late. 40°.19' No. Longe. 235°.53' Et. bearg by Compass S.E. dist. 5 Leags. nearest Shore E.b.N. 10 Miles dist. Vartn. 15°. Easly. CAPE ORFORD in Lat. 42°.52' N. and Long. 235°.35' E. bearing N. 27 W. dist. 5 Leagues nearest Shore No. 64 E.3 Miles & dist. Varn. 16°. Easly. The profiles record the dominant features of the landscape, including geological form, contrasts of light and shade, types of vegetation, and atmospheric phenomena. In the profile of Cape Mendocino, for example, six black sea-stacks are silhouetted against lightly coloured cliffs that mark the border between the ocean and a group of small rounded-hills. The hills are denuded except for a few small trees, divided from each other by deep valleys, and screen the landscape behind them. The profiles of Cape Orford and Cape Gregory are different. In the former, four rocky islets stand sentinel before a scene in which mountain peaks rise from behind hills that slope gently to the sea, their slopes "covered with wood as low down as the surf will permit it to grow" (1: 205). In the latter, tall cliffs divide the ocean from the Cape and from a chain of hills—all covered by dense forest. Point Grenville is the most dramatic, even though it is viewed at a greater distance from the shore: tall cliffs and, immediately in front of the Point, a cluster of seven sea stacks, stand at the centre of a sweeping coastline, which stretches from the right- to the left-hand margin of the design. Behind the cliffs, the peaks of a mountain range can be seen, crowned by a large band of cloud. The effect is different again in the profiles labeled "Entrance to the Straits of Juan de Fuca" and "A continuation [of this view of the Straits of Juan de Fuca] along the "Coast Sh.ward from Cape Flattery." Together they provide a remarkable extended profile, which rises erratically from ocean to cliffs, rolling hills, and mountain range, before culminating (near the right-hand margin of "A continuation") in the "very elegant double fork" of Mount Olympus (Vancouver 1: 214), its twin summits covered in snow and framed by clouds. "Views of Parts of the Coast of North West America" was published in the Atlas accompanying George Vancouver's A Voyage of Discovery to the North Pacific Ocean and Round the World (London, 1798). The Atlas contains 10 charts and 6 sheets of views: nine of the former map the coast of northwest America; 5 of the latter provide profile-views of the same coast. The remaining map and view are, respectively, "A Chart of the Sandwich Islands" and "Views of the Sandwich and other Islands." Captain George Vancouver led a 4½ year "Voyage of Discovery," "the longest in the annals of British exploration, covering an estimated 65,000 miles" (Barnett 15)—from England to the Cape of Good Hope, New Holland [Australia], Van Diemen's land [Tasmania], and New Zealand, then the Tahitian and Sandwich [Hawaiian] islands, and the northwest coast of America, before travelling back to England via Cape Horn. The primary tasks of the expedition were "to settle the details of a disagreement between Spain and Britain over who was to have the right to exploit the resources of the Pacific" (Fisher and Johnston 10); survey the North American coast, "from 30° to 60° north latitude" (Lamb, ‘Vancouver's Charts', 99); and "ascertain the existence of any navigable communication between the North Pacific and North Atlantic Oceans" (Vancouver, title page). 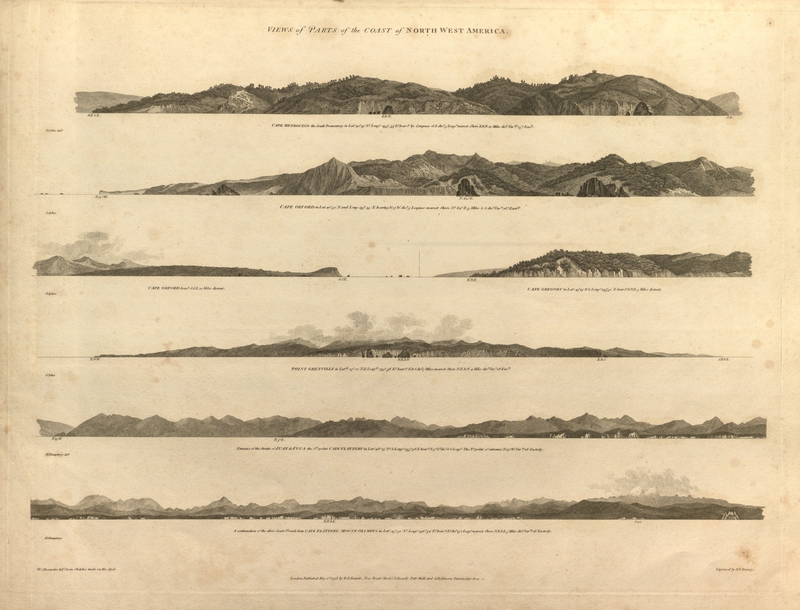 These profiles depict some of the landscapes seen by George Vancouver, as he sailed along the northwest coast of America, from Cape Mendocino to Cape Flattery, a journey described in the first volume of A Voyage of Discovery. Sketches made on the spot by Henry Humphrys and John Sykes. The primary subject of this sheet of coastal profiles is the northwest American coast, fragments of which it presents as synecdoches for the whole. Before James Cook's voyages of discovery, naval draughtsmen created coastal, island, or harbour profiles only in broad outline, primarily as an aid to navigation (Richardson 69). But here the draughtsman/artist is also interested in the various forms and types of coastal landscape. The profiles accordingly provide a catalogue of forms, much as a botanist might document plant species, which is presented as a visual counterpart to the narrative recounted by Vancouver in A Voyage of Discovery (Dickenson 219). Alexander Humboldt remarks in Personal Narrative of Travels to the Equinoctial Regions of America that from the coast of a continent travellers are unable to gather reliable information about its "geological constitution, the climate of each zone, and its influence on the forms and habits of organized beings" (xi). That is of course true. But in the profiles we are considering, this limitation indirectly presents an object of no trivial interest, namely "the unknown," in this case the vast land glimpsed in the passing view. Finally, the liminal space portrayed in these profiles—at the border of land and sea, the newly discovered and the still unknown—is the stage for Vancouver's numerous encounters with the American Indians. We can therefore say in brief summary that the subject of this sheet of profiles is simultaneously practical, scientific, aesthetic, speculative, and political. Romantic Period. Landscape. Coast of Northwest America. Point Grenville. Panoramic view. In contrast to the idealized scenes typical of eighteenth-century landscape painting and the less-detailed coastal profiles drawn by earlier naval draughtsmen, this sheet of coastal views represents an attempt to catalogue the forms and types of landscape found on the northwestern coast of America. The profiles are both instructive and aesthetically appealing, and as such are emblematic of changing emphases in, and a strong popular market for, the art of exploration (Richardson 66-74; Kesler). The geographical coordinates accompanying each profile allow them to be located on Vancouver's charts, which are intended to fill the blank spaces on James Cook's large-scale maps, which in turn provide a map or "general picture of the world" (Richardson 73). At the same time, the European names given to these locations eclipse their Indian names and the cultural systems of which they were part. As such, they represent an attempt to orient the viewer in an unfamiliar world, by introducing terms and frames of reference drawn from Europe. This collocation of world-map and European observer helped create the terrain on which modern global empires could be imagined (Richardson 200). Notwithstanding these remarks, it is important to add that the play between map and profile (abstract grid and particular place) is emblematic of the belief, inaugurated in its modern form by John Locke (1632-1704), that knowledge rests on experience. It can therefore be argued that, to the extent that coastal profiles evoke a realm beyond what has been experienced, and in so doing represent a liminal zone between disparate, perhaps incommensurate cultural worlds, they also contain in embryo the multi-perspectival world (without any pre-ordained centre) explored by Romanticism, which includes the possibility that what Europe has taken to be the real could be differently imagined. In the Atlas accompanying A Voyage of Discovery, sheets of coastal profiles, such as the one we are considering, are interleaved with Vancouver's charts of the northwest coast of America. In this context the profiles function in a variety of ways: as supplements, adding a wealth of detail that maps are unable to contain; devices to help navigators recognize key locations; catalogues of geological forms and features; and aesthetic objects, designed to appeal to a popular audience. In concert with Vancouver's "unvarnished" narrative and the views with which it is punctuated, maps and profiles evoke for readers the contours of a still unexplored world. Barnet, James K. "Alaska and the North Pacific: A Crossroads of Empire." Enlightenment and Exploration in the North Pacific, 1741-1805. Eds. Stephen Haycox, James K. Barnett, and Caedmon A. Liburd. Seattle, WA: Published for the Cook Inlet Historical Society in the Anchorage Museum of History and Art by the University of Washington Press, 1997. 3-22. Dickenson, Victoria. Drawn from Life: Science and Art in the Portrayal of the New World. Toronto: University of Toronto Press, 1998. Gough, Barry M. "Barkley, Charles William." Dictionary of Canadian Biography. Vol. 6. University of Toronto/Université Laval, 2003 [http://www.biographi.ca/en/bio/barkley_charles_william_6E.html, accessed 15 October, 2013]. Fisher, Robin and Hugh Johnston. "Introduction." From Maps to Metaphors: The Pacific World of George Vancouver. Eds. Fisher and Johnston. Vancouver: UBC Press, 1993. 6-18. Henry, John Frazier. Early Maritime Artists of the Pacific Northwest Coast, 1741-1841. Vancouver and Toronto: Douglas & McIntyre, 1984. Humboldt, Alexander von. Personal Narrative of Travels to the Equinoctial Regions of America, during the years 1799-1804. Trans. Thomasina Ross. 3 vols. 1822; London: Henry Bohn, 1852. Payne, Anthony. "The Publication and Readership of Voyage Journals in the Age of Vancouver, 1730-1830." Enlightenment and Exploration in the North Pacific, 1741-1805. Eds. Stephen Haycox, James K. Barnett, and Caedmon A. Liburd. Seattle, WA: Published for the Cook Inlet Historical Society in the Anchorage Museum of History and Art by the University of Washington Press, 1997. 176-86. Lamb, W. Kaye. "Vancouver's Charts of The Northwest Coast." Explorations in the History of Canadian Mapping: A Collection of Essays. Eds. Barbara Farrell and Aileen Desbarats. Ottawa: Association of Canadian Map Libraries and Archives, 1988. 99-111. Richardson, Brian W. Longitude and Empire: How Captain Cook's Voyages Changed the World. Vancouver: UBC Press, 2005. "Views of Parts of the Coast of North West America," included in the Atlas that accompanies A Voyage of Discovery to the North Pacific Ocean, and Round the World; in which the coast of North-West America has been carefully examined and accurately surveyed. Undertaken by His Majesty's Command, principally with a view to ascertain the existence of any navigable communication between the North Pacific and North Atlantic Oceans; and performed in the years 1790, 1791, 1792, 1793, 1794, and 1795, in the DISCOVERY Sloop of War, and armed tender CHATHAM, under the command of Captain George Vancouver. In three volumes. London: Printed for G. G. and J. Robinson, Paternoster-Row; and J. Edwards, Pall-Mall, 1798.